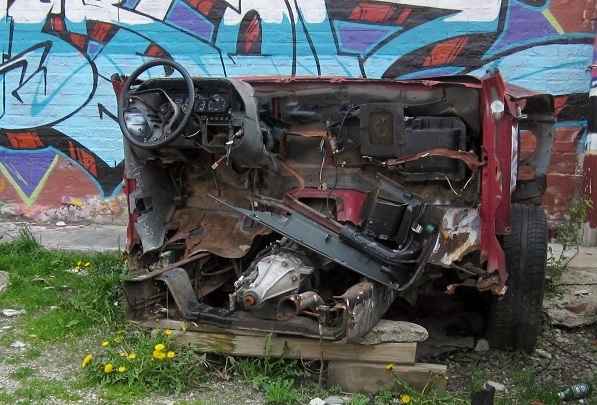 Pilsen gets Slammed by Poetry. Chicago has a long history of promoting poetry. The Poetry magazine has provided poets from Kilmer to Trethewey with vital exposure for more than a century. The first poetry slams were created at Chicago's Green Mill by the legendary Marc Smith and still thrive there today. 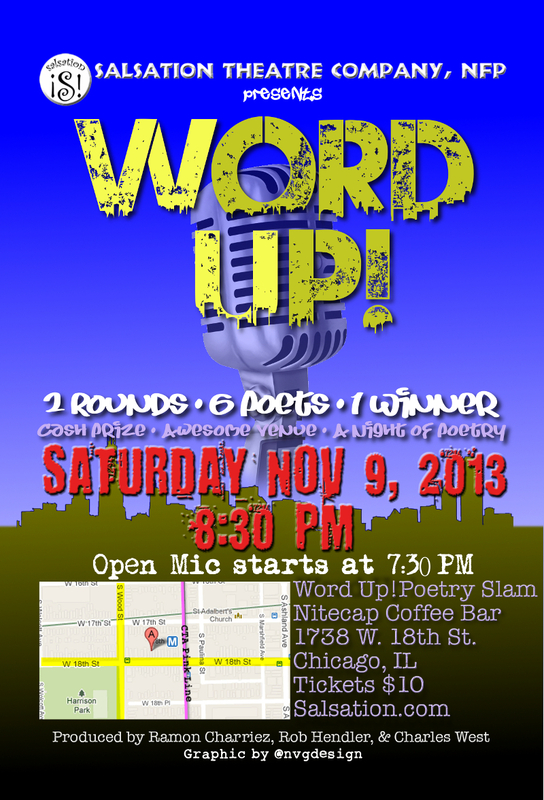 Saturday November 9 the tradition continues as the Nitecap Coffee Bar in Pilsen gets slammed with the latest round of the Word Up! poetry slam. Word Up! — an offshoot of the Salsation Theatre Company — has been bringing together local spoken word artists since August 2012. The slam itself consists of a single theme with six poets competing in two rounds. The final two poets will face off against each other and extemporaneously improvise their final slam on a theme determined by the audience. Along with bragging rights and a cash prize, the night's winner will be invited back to the next Word Up! slam. Ramon Charriez, one of the founding members of Salsation and a coproducer of the Word Up! slams is excited to be back in the suddenly hip Pilsen. The coffee bar at 1738 W 18th Street hosted Word Up!5 following an introduction of Charriez to Nitecap Coffee Bar owner Aaron Marsh. "At that time, Aaron was getting ready for his grand opening and had begun locking in local artists and talent to grace his space," recounts Charriez. "I reached out to him with the concept of our show and a few weeks later we performed Word Up!5." "These events are, in a sense, unrelated to our main business focus, which is providing great locally roasted coffee," says Marsh. "But combining a deep rooted love of music and theatre with our dedication and investment in our neighborhood — Pilsen — naturally lead to a desire to offer our space as a resource for access to the arts. The Word Up! Poetry Slam fits perfect here!" Appearing in Pilsen are an eclectic mix of performers: James Gordon, the Greatest Poet Alive; book illustrator Warren Polk III; Eric Sirota, a member of the Mental Graffiti Team that represented Chicago at the National Poetry Slam in Boston this past August; Tumelo Khoza, a poet hailing from Durban, South Africa; Emilio Maldonado, whose poetry "carries a sensibility that resonates of yearning," and; spoken word poet and warrior woman Adrienne Nadeau. The host of the event is Word Up!2 victor, Charles "Chuck" West. Featured poet for the evening is Rob Hendler — Word Up!4 champ. As well as being past winners, Chuck and Rob also serve as coproducers for Word Up! alongside Ramon. Tickets are available through Salsation or at the door for $10. The Nitecap Coffee Bar is located 1/2 block west from the 18th Street Pink Line stop. Marsh reminds patrons of the arts and fine coffee that, "Nitecap also hosts Open Mic every Monday evening, and is developing The Voltare Project — sort of an "anything goes" night — to feature one act plays, local musicians, comedians, etc. on the last weekend of every month." Labels: Aaron Marsh, Adrienne Nadeau, Charles West, Emilio Maldonado, Eric Sirota, James Gordon, Pilsen, Poetry Slam, Ramon Charriez, Rob Hendler, Tumelo Khoza, Warren Polk III, Word Up!